STAR Witness laid claim to the title of Australia's best sprinting three-year-old with a comprehensive win in the Coolmore Stakes in the first step towards what trainer Danny O'Brien hopes will be an international campaign in England next year. Star Witness won the Blue Diamond Stakes at Caulfield as a two-year-old but O'Brien had always believed he was better suited on straight tracks and no one at Flemington was prepared to argue with him yesterday. "He's an outstanding colt. He's won a group 1 at two and now at three. The sky's the limit. He's just a much better horse down a straight track," O'Brien said. Rather than having aimed at the Caulfield Guineas three weeks ago, O'Brien elected to bypass that group 1 for yesterday's race and he admitted the pressure was on himself and Star Witness to justify the strategy. "There was a lot riding on this race. We left the Guineas alone and concentrated on this race. The pressure was on us to produce him and have him producing, so today is very satisfying," he said. Star Witness had galloped brilliantly at Flemington on Tuesday morning, finishing just a length behind outstanding older sprinter Hay List but after drawing an inside gate there was some feeling he may not get a lot of galloping room, however the barrier proved no obstacle. James Winks, who was appointed O'Brien's stable rider only two months ago, managed to position him perfectly just behind the tearaway leader Solar Charged and with the field coming down the centre of the track there was plenty of room to manoeuvre him into the clear. He raced passed Solar Charged and Buffering inside the 300 metres and was untroubled in the run to the line, to win by two lengths. "He is a totally different horse down the straight. He finds a rhythm and relaxes. I actually had to grab hold of him again because was just going to get there [to the lead] way too early. When I pushed the button he put it beyond doubt," Winks said. Curtana ($41), who had been struggling in recent starts, ran a much improved race to close late and grab second placing in a run that didn't surprise trainer Peter Moody, with Shrapnel ($13) making good ground through the field over the final stages to grab third. 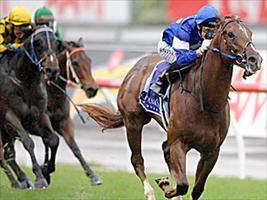 "It was nice to get a group 1 placing for a filly. We don't have many runners that start 50-1 but that was why we were here," Moody said. O'Brien said given Star Witness's affinity with the Flemington straight, his plan all along was to back up in next Saturday's group 1 Patinack Farm Stakes against Hay List And Black Caviar. "We planned to leave enough petrol in the tank to have two cracks during Cup week," O'Brien said. "He might even improve on today because he was a bit burly after Tuesday [trackwork] so I think he'll back up pretty well." The race was run in driving rain, having set in 30 minutes beforehand but O'Brien said he had not been overly concerned. "We just knew how well he was going. If it got drastically heavy it might have been a problem and I'm glad we weren't in race eight or nine," he said. Following next Saturday's run, O'Brien will give Star Witness a spell before bringing him back early next year for the Lightning Stakes (1000 metres) and the Newmarket Handicap (1200 metres), both run down the Flemington straight. "After next Saturday we'll look to come back here in the autumn and from there we'll perhaps look towards the UK next year," O'Brien said. The chances of one of the other fancies in the race, Soul ($7), ended near the 300 metres when Curtana laid in, inconveniencing Soul, who was looking to get into the clear, and General Truce, with Soul then battling on fairly to finish equal sixth. Highly regarded Sydney colt Pressday ($6) dropped out to the rear after making a mess of the start and failed to make any ground.